Graypants Studio’s iconic and recyclable Scraplight series just got a whole lot brighter. 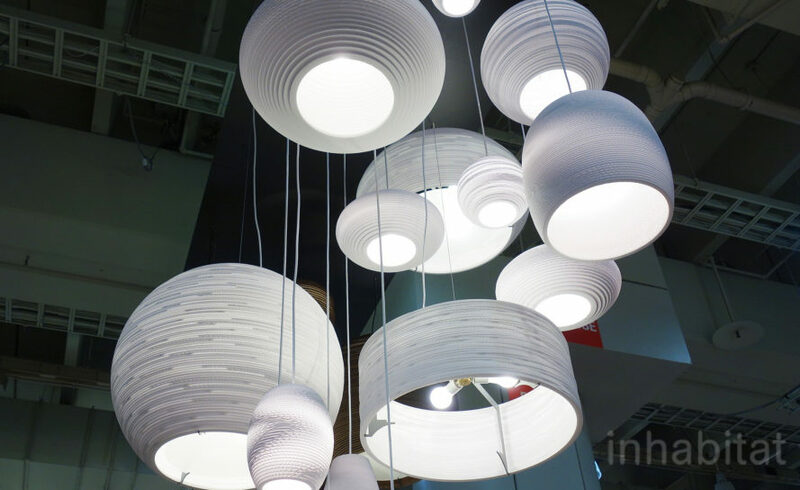 Spotted during New York Design Week 2016, the new Scraplight White series uses the same high-quality corrugated cardboard as the original line, but is designed with a lighter, airier aesthetic in mind. Made with FSC-certified paper, the luminous pendants give off a glow of crisp translucency, bringing bold light to any room. The new addition to the Scraplight series comes thanks to seven years of brainstorming. The original Scraplights are made from the company’s signature brown corrugated paper, and are known for giving off a rustic warmth that creates a cozy atmosphere indoors. But with the success of their first line, Graypants sought to design a version that would accommodate interiors needing bright, continuous light, such as office spaces or schools. The Scraplight White series was designed to be more open and translucent, and to give off a bright, modern glow. The lamps are handmade in Holland through a partnership with a social works program that provides craft-based jobs to locals, engaging the community around Graypants’ Amsterdam headquarters. Each paper piece that makes up the lights is also made from FSC-Certified paper, sourced from forests that continually replant more trees than harvested. Both the Scraplight White and original series are completely recyclable regardless of shape, and the fixtures and parts can be swapped out if they are ever damaged. Graypants’ Scraplight White is a sustainable alternative to their original series, perfect for event spaces, offices, or even at home. For seven years, Graypants Studios in both Seattle and Amsterdam collaborated to create the perfect new addition to the Scraplight series. The originals, made from signature brown corrugated paper, are known for giving off a rustic warmth that creates a cozy atmosphere indoors. With the success of the originals, Graypants sought to design a version that would accommodate interiors needing bright, continuous light- like forward-thinking office spaces. The Scraplight White series were designed to be more open and translucent, giving off a bright, modern glow. The lamps are handmade in Holland through a partnership with a social works program that provides craft-based jobs to locals, engaging the community around Graypants’ Amsterdam headquarters. Each paper-piece is also made from FSC-Certified paper, sourced from forests that continually replant more trees than harvested. Both the Scraplight White and original series are completely recyclable regardless of shape, with reusable fixtures and parts should the shade get damaged.